For the last study of the week the author asks the reader to read an excerpt from one of Ellen White’s books The Acts of the Apostles. 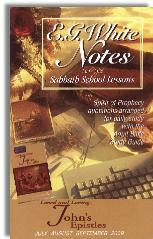 This writing gives in great detail the life of John during the beginning rise of the Christian faith. 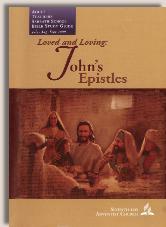 It elaborates on his writings, giving greater insight into who John was and how he served God. The author then goes into how necessary the writings of John are to our current life because of the false ideas that are being promoted in the world. John calls us to not believe everyone, to not accept new doctrines without testing them first for their biblical truth. We must have discernment to distinguish truth from error. Lastly the author lists what he believes to be the marks of a true Christian according to John: belief in Jesus as the Son of God who has com in the flesh; observance of the commandments of God; and love toward God and others. The main problem is the same problem that has plagued this and other Adventist Bible studies throughout its history: the desire to continue to observe the Old Testament law and the idea that it is necessary to the true Christian life. Nowhere in 1 John does it distinguish between the observance of the commandments of God and the love we should have toward God and others. The Bible is very clear that these two things are exactly the same thing, and 1 John does not muddle this fact. So when the author lists out the things which 1 John marks the true Christian, there is no reason to separate the author’s second and third points. A true Christian desires to follow the commandments of Jesus which are to love God and love one another. We cannot ever fulfill the requirements of God. That is the entire reason Jesus had to die on the cross. He was the payment for our sins and the fulfillment of the requirements of God. Also, the believer’s life was justified by the righteousness of Jesus once and for all time. There is no “could justify” in a true Christian’s life. The true Christian IS justified through the blood of Christ Jesus shed on the cross. The Adventist church believes obedience to the Old Testament law is the mark of true Christian behavior. The Bible states that the mark of a true Christian is the belief in Jesus as Lord and Savior. In no way can we ever fulfill the requirements of God. Only Jesus can do that, which He did once and for all on the cross.